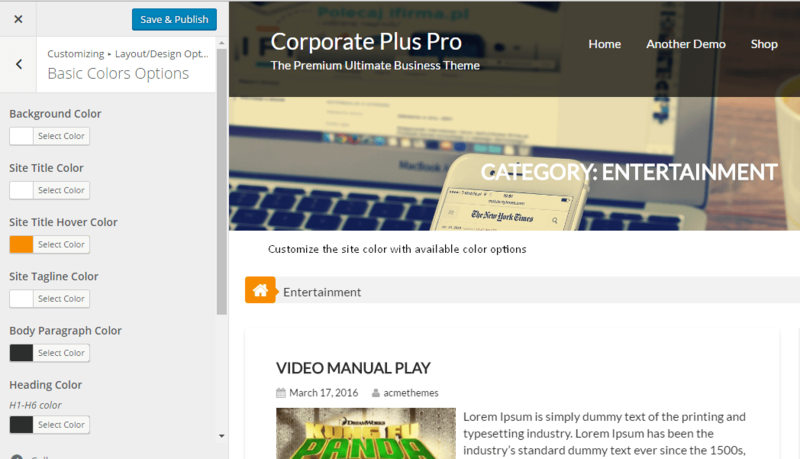 Corporate Plus Pro is a simple and clean theme with responsive layout. This theme is specially designed for Corporate Offices, Freelancing sites, Magazine, Blog and News sites. This theme have lots of options for building your website as your need. Easily and replaceable logo, favicon, social icons, background image, custom menu, slider, video in place of featured image, advanced pagination, breadcrumb, and lots of widgets for building your theme as your need. 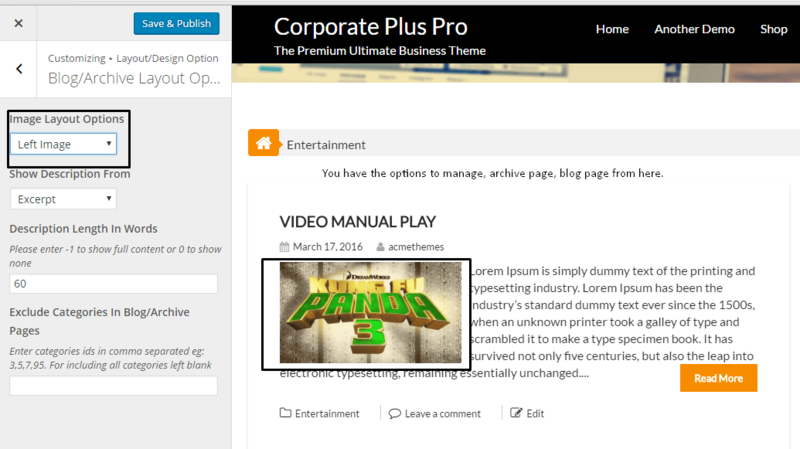 We believe this documentation help you to install, setup and customize your site using our theme ‘Corporate Plus Pro’. 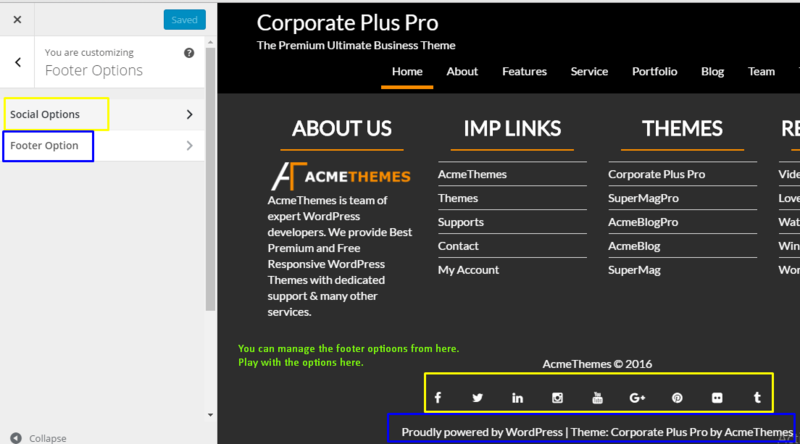 Download Corporate Plus Pro theme from Acme Themes on your desktop or other specified folder. Click on Uploads and browse the corporate-plus-pro.zip from the desktop or other specified folder you have downloaded it. Note: Theme bundle contains Parent theme and child theme. It is recommended to activate child theme. (Parent theme must be available on Appearance>Themes for working child theme). 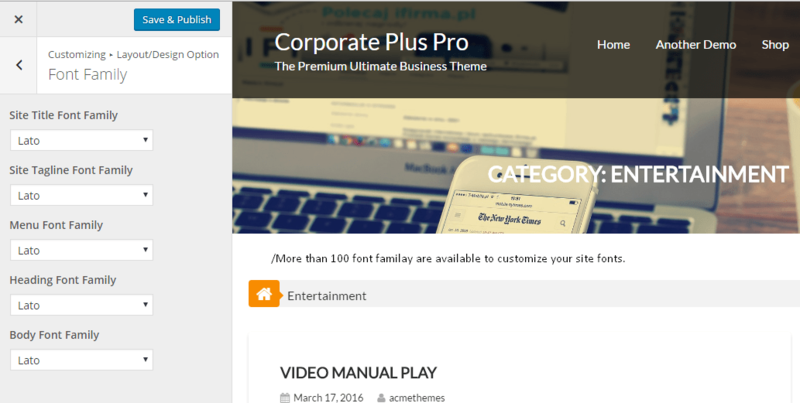 Download Corporate Plus Pro theme from Acme Themes on your desktop or other specified folder. Unzip corporate-plus-pro.zip to your Desktop on other specified folder. Using an FTP client to access your host web server. Go to /wp-content/themes/ and make sure that you do not already have a corporate-plus-pro folder installed there. If already installed there, then back it up and remove it from /wp-content/themes/ before uploading your copy of Corporate Plus Pro theme. 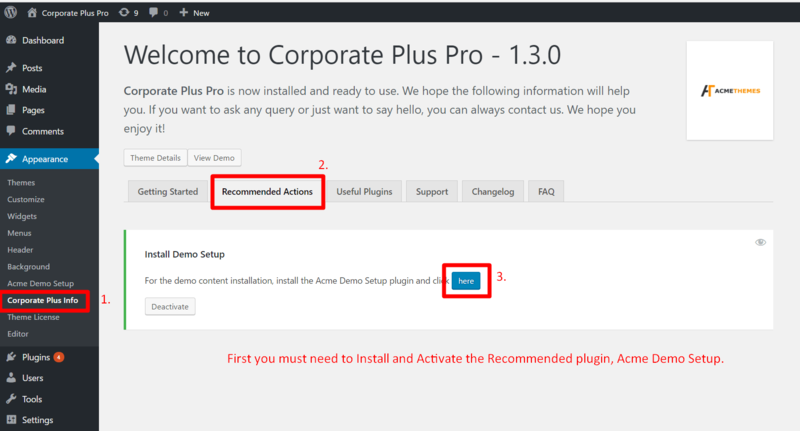 You can find the demo content on one click on Appearance > Corporate Plus Info > Recommended Actions > Install Demo Setup > Here. 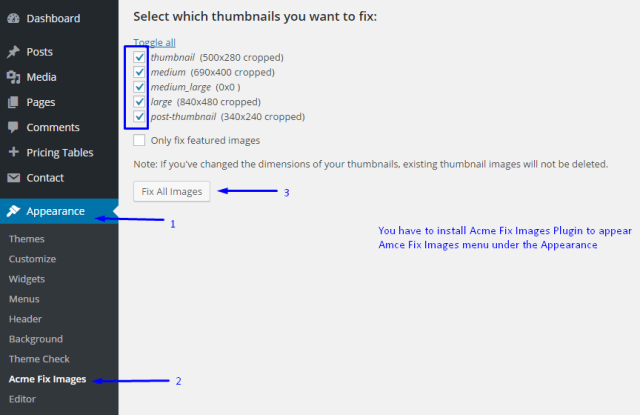 You need to set the images size from media and need to use the plugin Acme Fix Images to make the images size suitable for this theme. 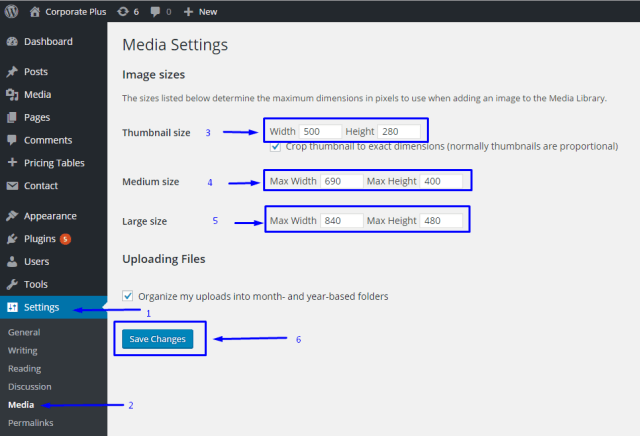 Follow the below instruction to fix the images sizes. 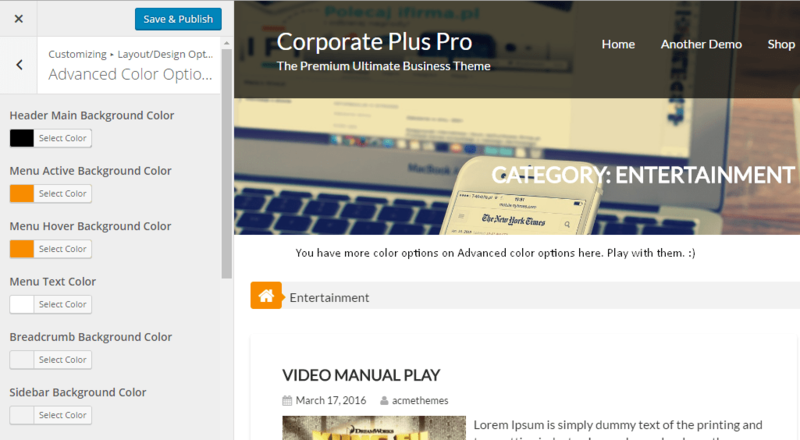 ‘Corporate Plus Pro’ comes with advanced Theme Customization options. There are two menu area, “Primary” and “One Page Menu for Front Page”. “Primary” menu appears on inner page and “One Page Menu for Front Page” appears on front page. If you only select primary menu, it will appear on whole site but if you select “One Page Menu for Front Page”, it will only appear on Front page. In the URL field, please enter the Section ID(#section-about). Don’t forget to enter ‘#’ before the section name. Section name must match with the widget Section ID. 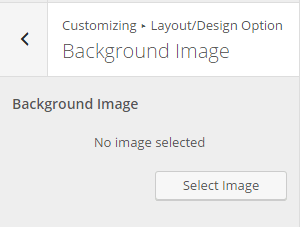 How to enable slider on featured section ? How to select slider from page,category, recent post or make custom slides ? Select the options from the drop-down and choose any one of them. Customize the available options available there. How to control the slider on featured section ? How to enable/disable go to down on featured slider section? How to add header image ? How to enable social links on footer? You will find the necessary options for social links. Select the available number from Number Of Sidebars for footer area. 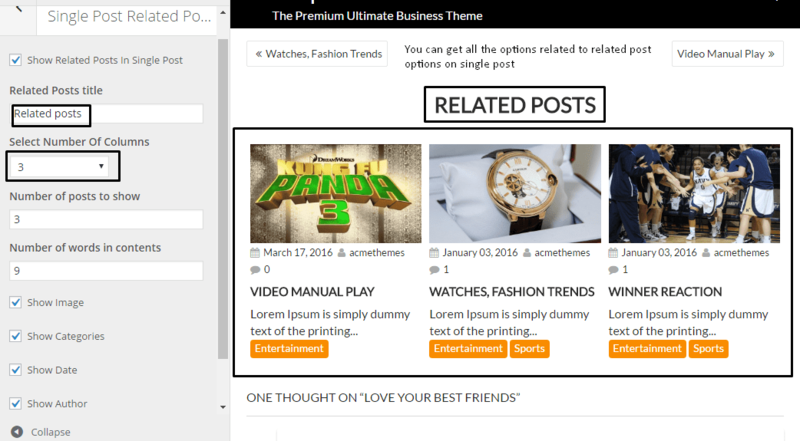 Corporate Plus Pro have Main Sidebar Home Main Content Area, Footer column one, Footer column two, Footer column three , footer column four. This widget is mainly use for managing About section on Front/Home page. You can use this widget on the sidebar too. Use the available options to manage this widget. Use the available parameters on this widget. You can use image, text or both on this widget. This widget is use for managing Client Section on homepage. If you are going to create a one page site, give the unique id name for this section at “Section ID:”. Short Description: Short description about this area. This description will display below the title. Select Parent Page For Client: Select parent page and its sub-pages will display in the front-end. If pages does not have any sub-pages, then selected single page will display. Client Number: Enter the number of client to display. Number of words in content: Number of words to display on this section for the content. Column Number: Select the number of column from the drop down. You can use up to 4 columns. Button Text: Enter the button text. Leave blank if not needed. Button Link Url: Enter the link for this button. Use this widget to make contact section on home page or on the sidebars. Please use contact form 7 for the contact section. Section ID: Enter a Unique Section ID. You can use this ID in Menu item for enabling One Page Menu. Title: Title of the section. Short Description: Short description about this section. Description will display below the title. Enter Shortcode: Please download and install Contact form 7 and enter the shortcode given by the contact form 7. Select Background Image: If you want to use background image for contact section, please upload image. Advanced Featured Section with Parallax Background. Please use the available parameters for to make the featured section. This Widget is use for making portfolio section on Front Page/Home Page. 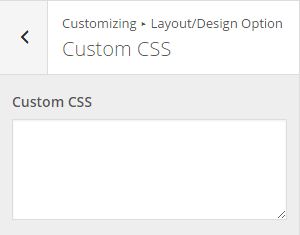 Use the available parameters for customizing this section. Use the remaining available widget as your need.